MANHATTAN SUPREME COURT — A mistrial was declared Wednesday in a case where prosecutors hid the role of a federally-indicted NYPD detective in a drug bust until the last day of testimony — a missing piece of testimony that jurors said prevented them from reaching a verdict. Alshon Williams, 38, faced felony drug charges for allegedly selling drugs to an undercover cop in Harlem. While one cop took the stand to identify Williams as the alleged drug dealer, prosecutors didn't call other key officers involved in the arrest, including NYPD Det. Richard Palase, who had been indicted for allegedly running a $6,000-a-day Staten Island gambling ring. Jurors said they thought the fact that prosecutors relied on the word of just one cop to identify Williams as a drug dealer was insufficient evidence to prove his guilt. "The issue was just that there was nobody who could identify the defendant leaving [the building] — it was just one guy," said juror Jesse Krulwich, 26, a physician's assistant from Chelsea. Det. Edison Alba, who was part of the team that busted Williams on Nov. 9, 2010, testified he made the drug purchase from Williams and later confirmed Williams's identity through tinted police car windows while driving by in an effort to not blow his cover. Palase, a 15-year NYPD veteran, worked as a "ghost" in the buy-and-bust operation, or the backup for the cops directly involved in the operation. Palase was sitting in a parked car nearby, and alerted the arresting officer of Williams' identity after the drug sale, according to the testimony of another officer who took the stand. The Special Narcotics Prosecutor's office initially opted not to call Palase, known to jurors only as Undercover 0015, or reveal his role in the case and the criminal cloud over him. It was not until another officer mentioned Palase on the stand and Manhattan Supreme Court Justice Roger Hayes asked about his whereabouts that they that they revealed his involvement, the day before the trial was set to end. Palase eventually appeared at Williams' trial, under subpoena, on Oct. 3. He spoke to the judge outside of the jury's presence and told the court he would invoke his Fifth Amendment rights if called to the stand to testify about the case. 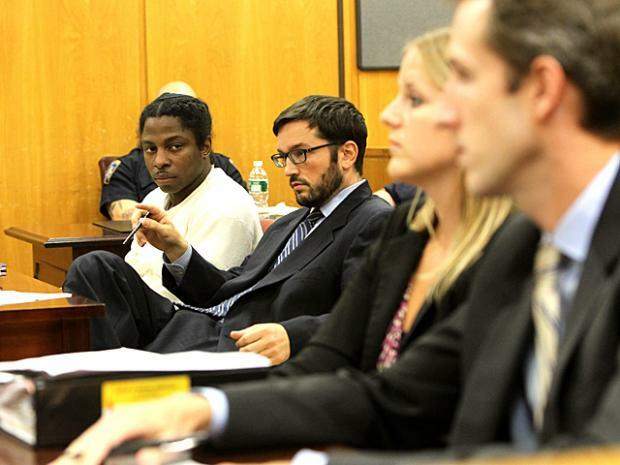 Jurors were not told about his indictment charges, which came after the Harlem drug bust. Krulwich said he and his fellow jurors noticed the omission of Palase — who they only knew as the "ghost" in the case — and wondered if he could have bolstered prosecutors' case. "Really, I wanted the ghost, because really nobody saw [Williams] leave the building," said juror Jesse Krulwich, 26, a physician's assistant from Chelsea. "I need the ghost to testify." Patrick O'Neill, a 23-year-old student from the Upper West Side, said he wanted to acquit Williams. He said he and his fellow jurors felt duped by Palase's absence from the witness stand. "I feel a little bit misled and manipulated. In the end that's exactly what the trial is — its a manipulation of the facts by the defense and the prosecution," O'Neill said during a phone interview after the jurors were released. "We all just assumed the reason he didn't testify was because it would have blown his cover." Jurors only knew that the "ghost" was a veteran nartotics cop that was not called to testify for an undisclosed reason. The jurors only learned of Palase's indictment from a reporter after the trial. "The ghost would be the only other person to corroborate the identity of Williams, which is a key factor in the whole trial," he said. "Had the ghost testified, his testimony would have counted for a whole lot, and might have changed everyone's perception of the trial." Fellow juror Bill Moore, 46, of the Upper West Side, said he also wondered about the "ghost" and why he didn't testify. "The entire procedure just didn't seem sound to me," Moore said. "It was a strange way to do a drug case." Prosecutors denied that Palase's federal indictment was the reason they didn't put him on the witness stand, saying they had no need for his testimony. "I was told it was a non-issue that the ghost was indicted in this case because he was a ghost and a witness the people believe was not necessary to our case," Assistant District Attorney Elizabeth Sheetz argued last week when questioned by the judge. The Office of the Special Narcotics Prosecutor did however, reveal that Palase worked as a "ghost" in "Operation Ivy League," an investigation that led to the arrest of five Columbia University undergrads accused of dealing marijuana, cocaine, powdered ecstasy, Adderall and LSD on campus and out of their fraternity houses, shortly after the officer's arrest. Williams is still being held on bail, pending a re-trial. His bail amount was reduced from $2,500 cash bail to $5,000 bond. He has been unable to post bail since his arrest last year. "As the assistant district attorney said in court, the office plans to retry the case," said Kati Cornell, spokeswoman for the Office of the Special Narcotics Prosecutor Bridget Brennan. "Given that, we cannot comment further." "Reporting on this trial has been consistently misinformed. No one 'hid' anything from the jury. The judge ruled that undercover 15 was an inconsequential witness. The judge makes legal rulings and often excludes inflammatory but irrelevant information. For example, a jury rarely hears about a defendant's criminal record, even though most jurors would be curious about it. Simply because a juror would like to know information does not make it legally relevant, and the failure to get it does not impair the integrity of a proceeding."